The onset of menopause in women triggers varied symptoms and hair loss is one of the distressing symptoms women undergo during this period. The hair loss during menopause can be attributed to hormonal imbalance. With the approach of menopause, estrogen levels plunge considerably causing dry hair and hair loss. Menopause can be a daunting time with many physical changes taking place in the body and tress troubles only add to the prevailing stress. Hair loss signals loss of youth and femininity, thus hurting the self esteem of women. Hormones: When menopause strikes, there is an imbalance in hormones resulting in an increase in male hormones (testosterone) and a reduction in female hormones (estrogen and progesterone). As sufficient levels of estrogen are not present to regulate testosterone, it gets concentrated in the blood stream and changes into Dihydrotestosterone (DHT). DHT is known to cause inflammation of the scalp resulting in narrowing of the hair follicles. As these changes take place, 50-plus woman start noticing thinning of hair with wide crown partings. Other factors: Though hormonal imbalance is the primary cause of hair loss during menopause, other factors like stress, anxiety and poor diet also take a toll on hair loss. Low level of iron in the blood also leads to hair thinning and hair loss. Many women experience heavy menstrual cycles as they approach menopause. Excess bleeding also leads to iron deficiency thus resulting in hair loss. Genetics also play a significant role in hair loss. Those with strong genetic disposition run the risk of undergoing female pattern hair loss also known as female pattern alopecia. Though it starts at as early as puberty, women experience it the most during menopause period. Genetically, hair loss can come from either parent's side of the family. Sometimes certain medical conditions such as thyroid, high blood pressure, lupus, diabetes and rheumatoid arthritis also lead to hair loss. Hence it is always advisable to consult a dermatologist and rule out other underlying health conditions before blaming the hormones for the mane loss. 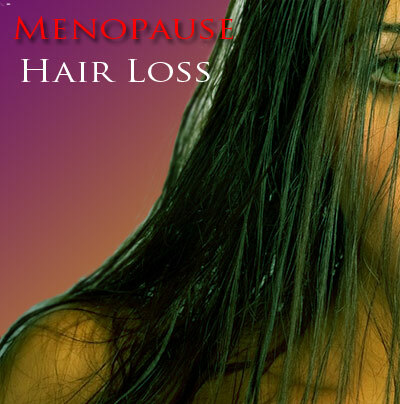 Having understood the causes of hair loss during menopause, take a look at ways to combat it. Though some amount of hair loss is expected during the menopausal stage, shedding can be minimized by directly addressing the underlying cause. Some treatments are directed towards correcting the hormonal imbalance, while others treat underlying conditions that cause hair loss. Topical treatments too are quite effective in treating female pattern hair loss during menopause. Though one may not regain the lustrous locks of youth, hair loss can be arrested to some extent by following appropriate treatment plan. Treatment for hair loss can be basically classified into two types. One approach is to treat it with pharmacological options that include medicines like anti-androgens and minoxidil. The other option is to go for simple dietary and lifestyle changes, herbal therapy, and reducing stress and scalp treatments. Cosmetic camouflage is another way of dealing with menopausal hair loss. Medication is usually prescribed either to block testosterone or increase the estrogen levels as imbalance in these two hormones is the primary cause of hair loss during menopause. The most commonly used medicines to block testosterone include spironolactone (Aldactone), Finasteride (Propecia and Proscar). HRT (hormone replacement therapy) is also opted for replacing the estrogen levels. However hormonal replacement should be used as a last resort as it is associated with numerous side effects. At present minoxidil is the only FDA approved topical medicine available to treat hair loss. It is applied to the scalp to stimulate hair growth. Minoxidil must be used on a regular basis in order to maintain or increase hair growth. Hair starts falling on discontinuation of the medicine. Minoxidil is available in two strengths 2% and 5%, but normally, 2% is only prescribed for women. There are various natural therapies available to treat mane matters during menopause. These methods win over medication as they are cost effective and devoid of any side effects. Proper attention needs to be paid to the diet - increasing the protein content in the meal. Diet containing B vitamins biotin, B6, and B12 and zinc are known to stimulate hair growth. Hence, special care should be taken to add food items that are rich in these essential vitamins. Avoiding alcohol (alcohol robs the body of its iron supply) and smoking is not only good for overall health but also for hair health. Regular exercise and incorporating certain stress relieving techniques such as practicing yoga and meditation go a long way in protecting your crowning glory. Herbal remedies are the safest and cost effective methods of treating hair loss. They naturally alleviate the hormone levels and thus restore hair growth. Herbs that are used to treat menopausal hair loss fall into two categories, Phytoestrogenic herbs and non-estrogenic herbs. Phytoestrogenic herbs introduce hormones in the body whereas non-estrogenic herbs help the body to produce its own hormones. Macafem is one of the popular non-estrogenic herbs available to treat menopausal hair loss. Some of the Phytoestrogenic herbs and their benefits are mentioned below. Black Cohosh is widely used to address hair woes as it is believed to stimulate the production of estrogen. It also blocks DHT from the male hormone, testosterone, thus preventing it from reaching hair follicles. 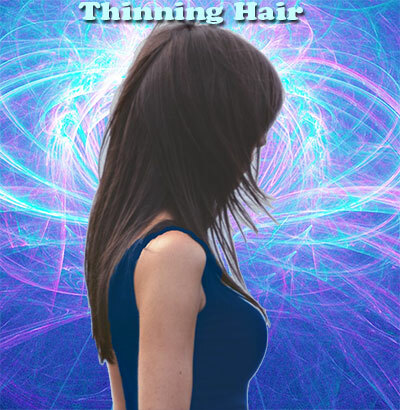 A combination of dong quai, chaste tree berry, and wild yam herbs is highly effective in combating hair loss. They are known to regulate hormonal imbalance thus arresting a hair fall. Soybeans and soy supplements contain isoflavones that act as a phytoestrogens and help in balancing the activity of estrogens in the body. Thus consuming soy products or soy supplements reduces hair fall tremendously. The extracts of saw palmetto plant have been most effective and an age old remedy for hair loss. It blocks the production of the enzyme called 5-alpha which is responsible for producing DHT (dihydrotestosterone), the hormone that causes follicles to shrink and hair to fall out. Increasing blood flow to the scalp boosts hair growth. As the blood flow increases, more nutrients reach hair follicles encouraging a rich crop. Massaging the scalp regularly with finger tips is the most widely accepted method to increase the blood flow. However acupuncture treatment, involving special needles, also gives encouraging results. Hair transplant surgeries, laser therapies and scalp lifts, are the other options for stimulating hair growth. These methods are highly expensive and are also associated with certain side effects. Hence surgical interventions should be used as the last resort, and should be handled only by reputed professionals. Cosmetic aids also come to the rescue to make women feel comfortable with their appearance. First Published Date: 19 Mar 2015 Last modified Date: April 18 2019 This page may have been updated recently as new information is available or the content may have been edited for better readability.